Fife Flyers can take a huge step towards the play-offs without leaving their building this weekend. The club has back to back home games against two clubs they have shaped up well against - and a haul of points would take them to within touching distance of the post-season competition. While six teams are chasing the four final spots, Fife are perhaps in the best position. Although seventh, they a five-point cushion over Manchester Storm in eighth with a game hand - and are tied with Sheffield Steelers in fifth, with two matches in hand. 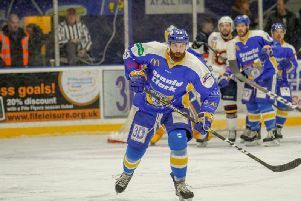 They are full control of their own destiny, and Todd Dutiaume, head coach, wants to ensure that remains the case after visits from Guildford Flames on Saturday, and Nottingham Panthers on Sunday. 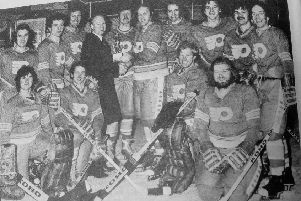 Flyers have swept Flames 5-0 across this season, while they have beaten an inconsistent Panthers home and away with the three other matches all going into overtime. Dutiaume believes his side missed a golden opportunity to shake up the pack when it only took two from four points on the road last weekend, with the 4-1 loss in Coventry rankling. “We were right in that hockey game with a great chance to make the jump above both Sheffield and Guildford. He is looking for his team to step back on to the page against Flames and Panthers, and deliver the points necessary for a good mid-table finish. But he admits that with so many teams having so much to play for, this tight race is far from over. “You have two teams at the top shooting for the title, Nottingham going for the Continental Cup, and everyone in the middle jockeying for position,” he said, “everyone has something to play for.